My dearest, of you alone I think day and night. Your red lips take all that is sad from me. To you have I given myself. Your own will I be, with you to live in joy until my ending. "The beginning was sweet and good ..."
In the Middle Ages, banquets were particularly sumptuous, and above all those for a wedding's celebration: partridges and woodcock, cheese and pastries, nuts and dried fruits — banqueting boards piled high groaned under the weight of such delicacies. In fact, governing authorities were often forced to counteract the excesses of such festivities with ordinances regulating how many guests might be invited and how many courses served. The ordinances, however, were not always effective. It was difficult to forbid lavish spreads and excessive drinking, or to prevent guests from dancing after a banquet. By the end of such wedding festivities, the men were often so drunk that brawls were the order of the day. A wedding has always been one of life's great events. And, in fact, most people had little choice about whom they married at that time since marriages were usually arranged by families. The needs of the family and the desire to advance its position in society dictated the terms, and as a result influence, money and power were what counted. Naturally, there were always those who advocated marriages for love and not money or influence, though even love matches could not guarantee future happiness, as a fifteenth-century Flemish song shows: "The beginning was sweet and good when I was courting my wife. Now heart, mind and soul have turned. I regret the first steps I took, poor man that I am. She rules the roost and I am like the chickens." In those days people often married very young and a Church ceremony was not the norm. Nuptials, at which marriage vows were exchanged in the presence of two witnesses, were a purely secular matter. 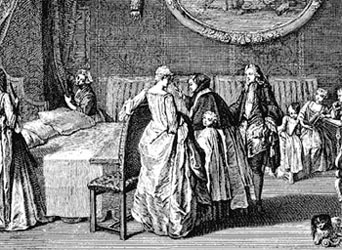 They often took place at home, in larger rooms or even in bedchambers, but the ceremonies were seldom recorded in paintings for posterity. 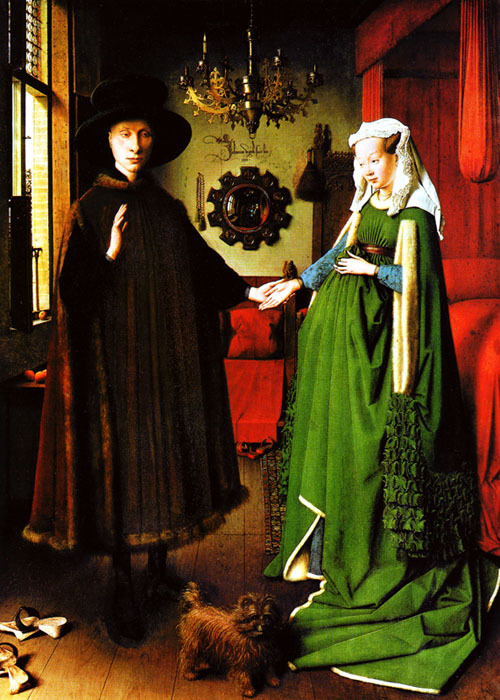 However, the wedding portrait The Arnolfini Marriage, by the Early Netherlandish painter Jan van Eyck, is a notable exception. Michele Arnolfini, the scion of an Italian mercantile family from Lucca who had settled in Bruges, is depicted with his bride Elizabeth. This pictorial marriage certificate, however, could never guarantee that the couple would stay together. Divorce was possible even then: "Since it is known that we cannot remain together — the devil has wrought this and God does not want us to be together — it is best that we dissolve our marriage ties." Thus a Merovingian divorce formula that was in use for a long time. Nevertheless, divorced people, like the unmarried, were socially ostracised. In Flanders an ultimatum was issued to a man of thirty, if he was still a bachelor. He was given a time limit within which he had to marry or he would have to endure the humiliation of being recorded in what was known as the "Book of Disgrace". If he didn't marry after all, he may well have done what old maids, priests, monks and nuns of necessity did, and sought comfort in St Augustine's words: "Those who die unmarried, shine like stars in Heaven."